It’s almost here! My annual studio sale. April 11, 12 & 13 in the hills above White Salmon Washington. 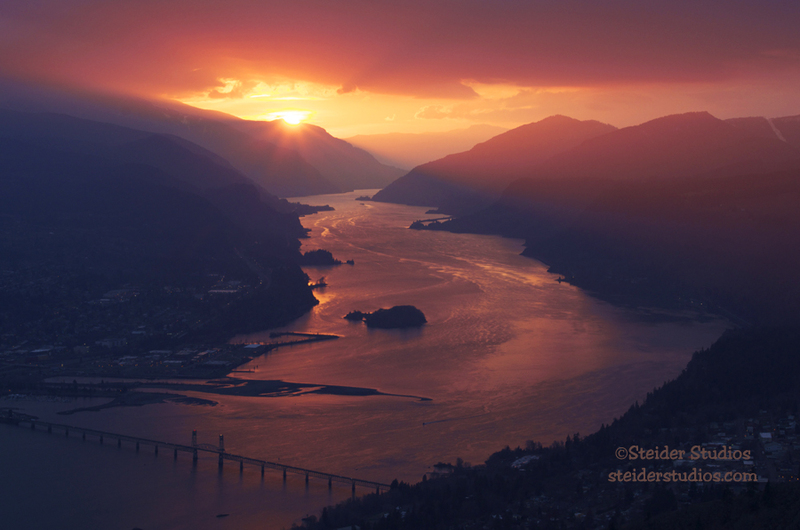 I’ll open my studio for three fun-filled days in conjunction with Gorge Artists Open Studios. It’s the only time ALL my work is unpacked and displayed in one setting. Enjoy a stroll through my garden on your way down to see my photography and art glass. 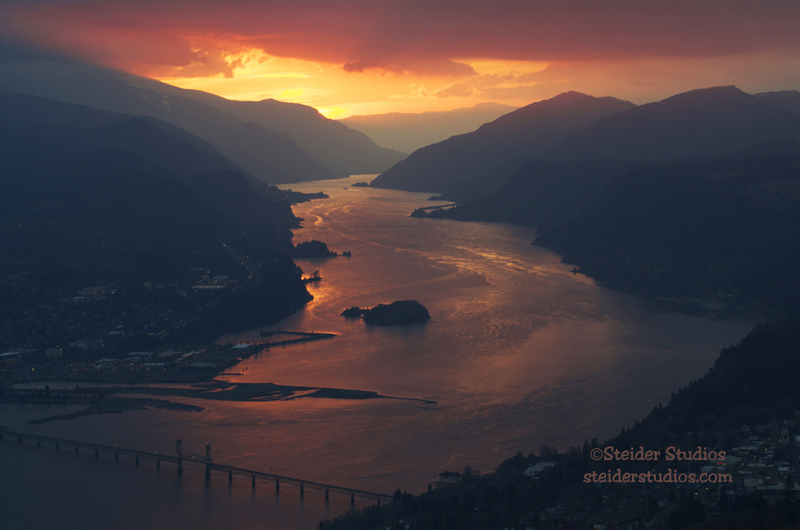 I just ordered new metal prints and all occasion greeting cards from my photographs. My kiln has been reloaded with MORE garden art. Last night I finished cold-working new earrings and bracelets. I have a feeling I’ll be finishing them between guests as there’s still so much preparation left to do! You can find maps at Mt Adams Chamber of Commerce or download a pdf from our website, http://gorgeartists.org onto your iPad or similar device. 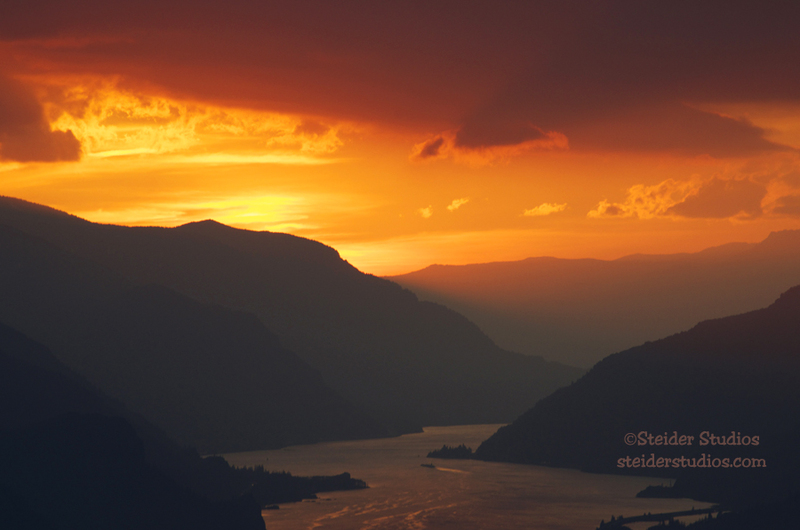 If you’re in ~ or will be in ~ the Pacific Northwest, I’m happy to send you directions, just send me a message. Until then, I’ll be scouring out my studio & unpacking all my work to show you! I am way behind, so instead of panicking I’ll just relive the last sunset of February. I was cooped up all last week with my computer, CreativeLive and Photoshop trying to learn new tricks. At the end of the last session on Friday I had to… no, needed to hike down my mountain for fresh air, green forest and hopefully a sunset. So thrilled I caught the last sunset of February just before March stormed in. On Sunday, in spite of the March storm I went to the Yard Garden & Patio show with my friend Kathy. We were so desperate for spring that we braved icy snowy conditions on Interstate 84. We cruised at a steady 35 to 40 mph & arrived in Portland in time for a fabulous Lebanese lunch and the show. Our trip home was not as pleasant with a 10-15 mph cruising speed crawling on bumpy washboard ice caused by semi trucks chained up. I confess that was better than the alternative – skating off the road like some of the abandoned cars we saw. Now I’m back in the throes of getting ready for my annual studio sale. and working with Gorge Artists Open Studios for next month’s self-guided tour of 40 artist’s studios. I always wonder if people will venture way up here to my spot on top of Burdoin Mountain to see (and purchase!) my glass & photography. If you’re so inclined, you can download a pdf of our map from our website onto your iPad (I think it would work on other reading devices too)! In preparation this year we have THREE venues showing a preview of our work! Tomorrow night, Thursday March 6th is the opening reception for The Dalles Art Center Preview Show. From 5 until 7pm you will meet many of our artists – I hope you can make the opening. We’ll also have a Preview Show in the lobby of Columbia Art Gallery with an opening First Friday, March 7th from 6 until 8 pm. Most of us will be there to talk about our work & we’d love to see you there. 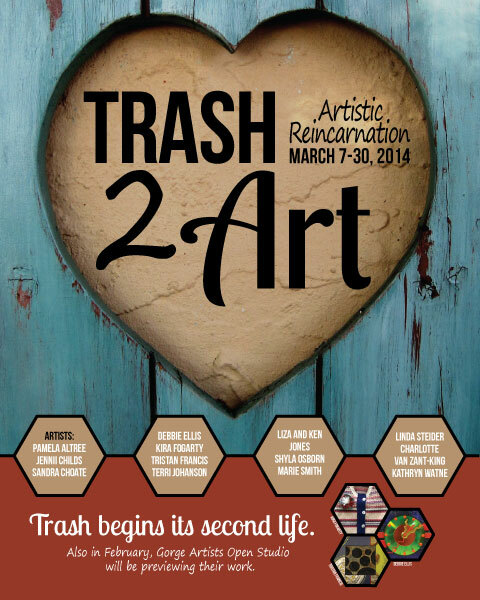 I also have work in the gallery portion of Columbia Art Gallery for the Trash to Art Show during the month of March. I’ll be hanging out between the lobby area and the gallery for the reception of both shows on First Friday. 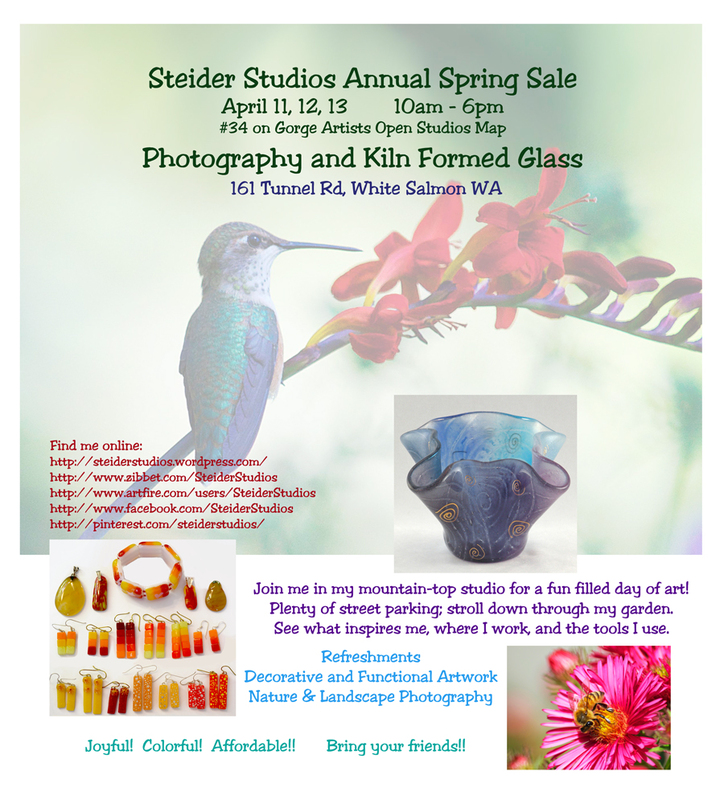 If that weren’t enough, the White Salmon Windows project is featuring participating studio tour artists downtown for the month of March. 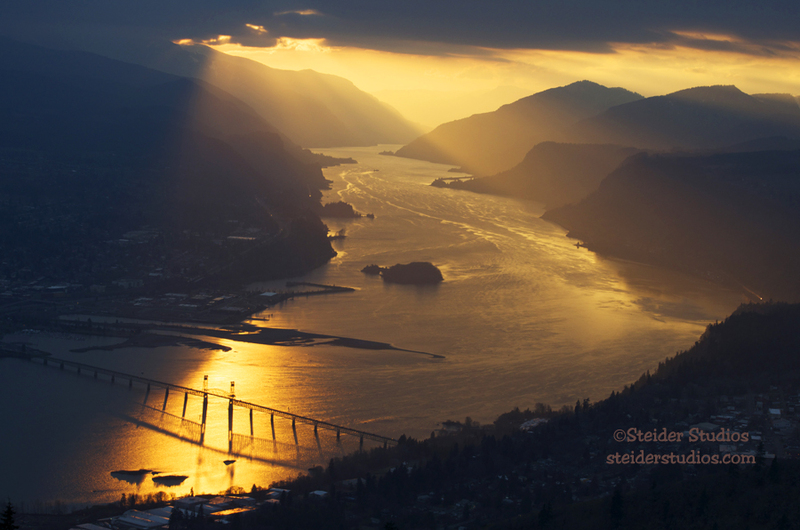 So, 40 artists have work spread throughout the gorge hoping to tempt you to come to our studios in April! I’ll post more information about my studio sale closer to the event & hopefully will have something interesting to post between now & then!! As always, I’m ever so grateful that you took a moment to visit with me! !